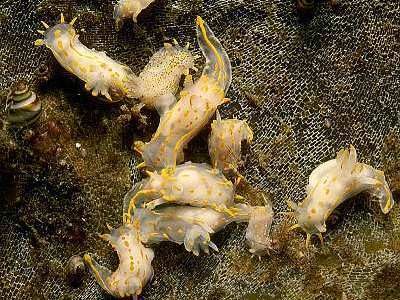 Description: The body of this nudibranch is usually translucent white with patches of yellow or orange pigment forming five longitudinal lines. However some individuals have fine black spots over the body and occasionally all the white area is coloured black. There are usually 4 (rarely 6) oral veil processes. At either side of the branchial plume there is a single orange tipped process. The tips of the rhinophores, propodial tentacles, oral lobes and gills are pigmented yellow. The maximum recorded length for this species is 45mm. Habitat: Feeds on Membranipora membranacea, a bryozoan species that grows on kelp, and also on other bryozoans such as Electra pilosa on red algae. It is often found in large numbers. The spawn is a short white curved ribbon. Distribution: Common all around the British Isles and from America to the Mediterranean. Similar Species: Sometimes P. quadrilineata is confused with Polycera faeroensis; however in the latter there are 8 or more oral veil processes and the patches of yellow pigment that are present on the dorsum of P. quadrilineata are normally absent. Four processes on the oral veil, two rhinophores without basal processes. White with yellow processes and body has elongate yellow spots. Picton, B.E. & Morrow, C.C. (2016). Polycera quadrilineata (O F Müller, 1776). [In] Encyclopedia of Marine Life of Britain and Ireland.